There are some aspects of the Heebe Investigation saga that will likely never die nor fade away……. Author Douglas HandshoePosted on April 23, 2013 March 13, 2014 Categories SopTags Garland Robinette, River Birch Landfill5 Comments on There are some aspects of the Heebe Investigation saga that will likely never die nor fade away……. The problem, of course, is I think only his wifey Nancy Rhett believes him. The reader comments sum things up nicely. I’ll add I contacted the FCC after the T-P put all the meat on the bones of a story Slabbed broke in December 2010 (on the down low) in the Robinette Federal grand jury subpoena as it is very clear the people at Entercom Communication’s WWL AM/FM are not to be trusted to report news in the public interest. Garlandfill’s microphone cost a man of Fred Heebe’s wealth a relative pittance and at scandals end it is the briefcase boy that ended up with a lifelong case of the mookie stinks. It is a recurring theme in the human condition. Aiming to stay on the offensive in the River Birch probe, federal prosecutors are preparing a new indictment to pile on additional charges – and perhaps add new defendants – as early as Thursday, according to court testimony and sources close to the probe. Mark Titus, who was sentenced Wednesday to five years in prison on a conspiracy charge, is likely to be charged in the superseding indictment, said his attorney, Jimmy Ardoin. In court, Ardoin revealed that prosecutors have given him notice of their plans to file a new indictment soon. Lifers here know the deal but for you newbies I’ll point out that Slabbed broke Garland Robinette’s subpoena to the federal grand jury investigating political corruption way back in November, 2010 with a tease and straight out in March, 2011 (if memory serves). The gang over at the Times Picayune picked up the ball and did some excellent reporting on same as Garland Robinette’s opinions are evidently for sale to the highest bidder. A few nights ago Fox 8 carried the latest developments with a 100% Team Garlandfill sourced report that rankled some of my readers. In the interest of presenting a complete picture I’d like to present yesterday’s story from the new NOLA Media Group on the same topic by Manuel Torres. I’m not sure why Robinette wants to continue fleshing this topic out frankly because all the gyrations about there being a “loan” between him and Heebe are based solely on his unsupported assertions and I personally don’t believe a word the man says, especially since St Tammany Parish land and mortgage records did not indicate a mortgage was ever officially filed. Finally Robinette’s self-serving rationalization about taking the money to build an art studio smacks of the exact type of self-entitled, pompous mindset we regularly skewer here at Slabbed. In Robinette’s case he violated the public’s trust. If you’re a newbie I’d encourage you to run Garland Robinette’s name through the search box on the right sidebar to access Slabbed’s prior coverage of this portion of the massive political corruption scandal in metro New Orleans. Welcome to the party Kaare. Not that Sal Perricone wasn’t 100% right in resigning his job with the US Attorney’s office after commenting on cases he was handling because what he did was wrong from an ethical standpoint but we’ve said all along Fred Heebe had no defamation case against Perricone and the latest news that Heebe has dismissed his suit against Perricone reinforces that. In fact hanging the threat of later litigation in the dismissal motions may be sanctionable conduct on part of his lawyers according to legal observers that speak with Slabbed. Since this whole deal broke the public has gotten to witness plenty of peacocking, huffing and puffing by many of the recipients of Perricone’s online barbs including former AUSA/Tee Vee legal analyst Donald “Chick” Foret and frankly it was over the top. In my view and despite the ethical problems associated with a prosecutors commenting online about cases they handle, most of Perricone’s comments line up nicely with sentiments expressed here on Slabbed by members of the very same legal community to which Perricone belongs, including his assertion that Heebe comes from a “long line of corruptors”. That the various defense attorneys are using Perricone ‘s comments to the hilt should come as no surprise as these guys are seasoned enough to use all the arrows in their quiver, including gifts such as the one Perricone served up commenting on the Times Picayune. At the end of the day the upcoming prosecutions will be about the crimes alleged to have been perpetrated by the various defendants such as Big D and not what Perricone wrote on the internet though the comments guaranteed Perricone a place in the narrative regardless of his current employment status. All I can say folks is Fred Heebe is throwing some serious money down this rabbit hole filing suit against Times Picayune commenter Henry L. Mencken. Gorden Russell has the breaking news for the Times Picayune and they included a link to the 151 page suit Heebe lawyer Kyle Shonekas filed in NOLA Civil District Court which mostly focuses on specualtion as to the identity of Henry L Mencken being assistant US Attorney Sal Perricone. The alleged defamatory comments are on pdf pages 3 and 4 of the suit and to my untrained eye look pretty weak. The T-P has 598 of the 601 total comments left to various stories by Mencken on his T-P profile page linked above and there is copy of all his remarks circa December 2011 in Heebe’s suit. From a bigger picture standpoint this really signals a new level of nasty between Team Heebe and Team Letten. The speculation as to Mencken’s identity is enticing but it is also not the legal question. Its inclusion in the complaint tells me this is way more than a simple prelude to a US style defamation suit. File this one under chilling effects from the mean streets of blogging. 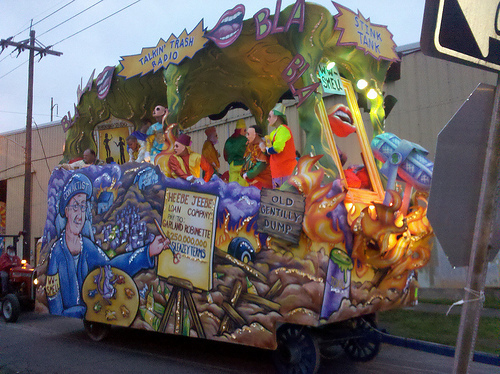 And the Krewe D’Etat too……. Garlandfill rolls by at 3:50, Aaron Broussard at 4:00. Author Douglas HandshoePosted on February 21, 2012 March 14, 2014 Categories SopTags Aaron Broussard, Entercomm Communications, Fred Heebe, Garland Robinette, Jefferson Parish Political Corruption Scandal, Krewe D'Etat, Payola, River Birch Landfill, WWL 870 AM Radio8 Comments on And the Krewe D’Etat too…….